I was recently in a department store in the women’s swimsuit area with two of my favorite women in my life: my wife and oldest daughter. I was doing my best to be helpful in the search for a new swimsuit for my 16-year-old. She and my wife were not immediately next to me when in my peripheral vision I noticed a nearby female shopper begin to move closer to me. As I awkwardly flipped through hanger after hanger of potentially suitable swimsuits, this nearby shopper handed me a small, thin booklet and mumbled something I couldn’t quite understand. Something about heaven, maybe? I think so. I think she was wanting to tell me something about heaven. Sort of. And just like that…I had been Jesused. Or something. I looked at the cover of the small booklet just long enough to know exactly what it was. It was an evangelism tool this woman had gotten from her church (the name of the church was printed on the front) to give to unsuspecting, ladies’-swimsuit-shopping men like me. Such tools are commonly referred to as “tracts”. They’re used in places like restaurants, shopping malls, street corners, and even toll booths. But why was she handing me this little booklet? And why was she mumbling? And why didn’t I feel happy to receive it? Perhaps she was giving it to me because clearly I needed Jesus. I mean why else would a full grown man be rifling through women’s swimsuits, seemingly on his own? I suppose I could chalk this up to her throwing a lifeline to a creeper. I suppose. Or is this her habit on any given night? At any store whatsoever? To anyone with a functioning hand that will take her little booklet from her? I may never know. 3. They often skip the most important part of evangelism, which is relationships. Obviously that old lady who cornered me with Jesus in that store didn’t have the time to get to know me or who I am or what I think and believe. And maybe I should lay off and just be thankful she did something, but isn’t sharing your faith more effective when you meet people where they are? Isn’t that how Jesus did it? What do YOU think? Am I being too hard on a sweet old lady? 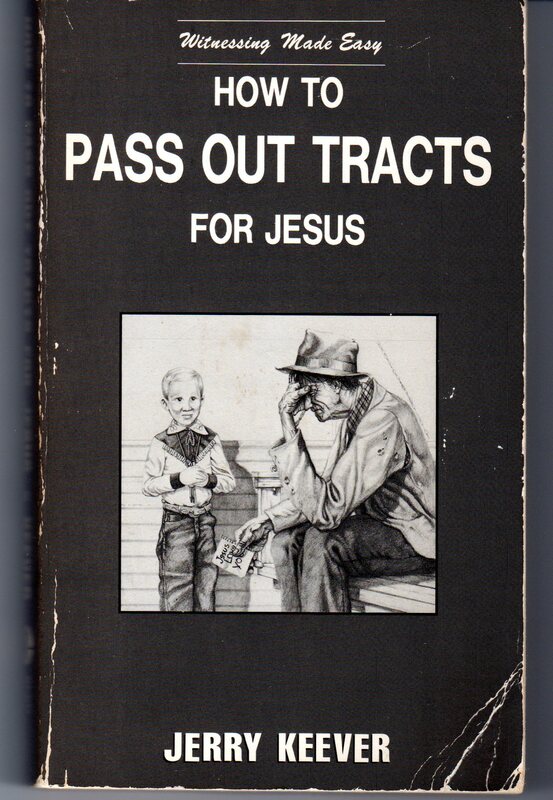 Am I being too hard on tracts? Now you knew that I would HAVE TO comment on this one! You have hit the proverbial nail on the head, man. Evangelism is ALL ABOUT RELATIONSHIPS. And the simple reason that is true is that evangelism doesn’t end with the decision to receive Christ but is followed by a longterm discipleship process between the one drawing and the one drawn. And THAT takes a real relationship! Good post! Well said Jerry!! Agree with you 100%!